This page follows on from the one about Georgian Vertical Pianos, which were usually very tall. People often talk about modern homes being small, but in the 1800s, most ordinary working people did not live in houses, flats, apartments or bungalows. If they were lucky, they might live in a small terraced cottage and, of course, some of these were only one-up-one-down. If they could afford an instrument at all, it had to be small enough to fit into their home, and this gave rise to names like "Cottage Grand" or "Cottage Organ". What we think of now as a "Cottage Piano" is quite specific, and perhaps the most obvious feature of the London-style Cottage Piano is the pair of tapering hexagonal legs, which terminate with trailing castors. The lower ends of the legs are not attached to the body of the piano, so it stands on the two leg castors, and the two back castors, with the result that in moving such an instrument, there is a considerable risk of breaking the legs. Although these instruments are often described as “Victorian”, they did exist a little while before Victoria’s reign, but within her lifetime. This is our Joseph Shaw London cottage piano, and my instinctive estimate of its date was around 1851, the time of the Great Exhibition, but it doesn’t seem fancy enough to have been exhibited, it is just a good example of an ordinary, domestic instrument. History is not just about Kings and Queens. When I looked up information on Shaw, the mean date was about 1851. The action was made by T.& H.Brooks, and the mean date for them was around 1849, but we have no definite date so far for the piano. Cottage pianos are the most common Victorian pianos to survive, they are difficult to sell, and if we rescue many more, we are in danger of being renamed “The Cottage Piano Museum” but we find it difficult to turn away history. Semi-Piccolo, Schrank, Universal, Unique, Upright Grand, Upright Square, Vocalist, etc.. Many of these were simply model names with no fixed definition, and what one maker described as a “Microchordon”, another might call “Piccolo” or “Semi-Cottage”, although “Cottage” was the default. Some were confusingly described as “Grand Microchordon”. This is our D’Almaine “Semi-Cabinet” piano of about 1846, kindly donated by Dawn & Keith Diamond. We inspected a very similar Hopkinson of about 1853 in The Museum of Lincolnshire Life. We have music books of the period containing a number of full-page ads for D’Almaine’s pianos. Some people question whether any of those instruments were originally made with tapestry fronts, and this is partly because of technical definitions of what constitutes a tapestry, but Collards certainly used them in 1851, and it is interesting that the panels of the ones that still have tapestry now are often quite similar in shape. Anyway, people find the old tapestry on our D’Almaine interesting in itself. D’Almaine defined them by height as Piccolo (3’11) Semi-Cottage or Microchordon (4’4½”) and Cottage or Semi-Cabinet (4’8½”). Some of Erards’ advertising refers to “Cottage and Oblique”, suggesting that they used the term “Cottage” specifically for their London-made straight-strung instruments, as distinct from their oblique-strung Paris models, which have the strings running diagonally. All of the cottage pianos shown here are dated on the side of the bottom key. The anonymous one on your right had tapestry, now replaced by an offcut of carpet. This example by Healey, 1847, only has pierced fretwork around the edges. The top door of a cottage piano (the top front panel) is typically made with beautiful pierced fretwork across the whole area, with many holes or larger open areas covered by a cloth backing, to allow as much sound as possible to escape straight towards the pianist. In many instances, the cloth is simply a muted background for pierced fretwork, but on our instrument by John Grogan, London, the opposite is true, the cloth is the main attraction, with a little fretwork around the edges. We can only estimate the date of the piano as being around 1858, but we have a firm provenance for the tapestry - £5.99 from our local QD Stores! When we got the piano, it had been fitted with an entirely inappropriate piece of modern plywood behind the fretwork so, not knowing what the original cloth looked like, we replaced it with an entirely inappropriate modern tapestry! Advertisements of the period sometimes referred simply to “a walnut cottage”, sounding more like an estate agent’s ad, with no clues to tell our modern eyes that they meant a piano. When we lived in Lowestoft, we called our house “Walnut Cottage” as a sort of in-joke for piano historians, then the name followed us to Yarmouth, but we did try to justify it by planting a walnut tree. The keyboard lid on a piano is known as a FALL, a very old name dating back to writing desks, and some of those were made with a CYLINDER FALL, looking like part of a smooth cylinder when closed. The idea started to be imitated in some late Georgian pianos. Up to the 1840s, some cylinder falls had 2 knobs to help in opening the keyboard. However, by the mid-1800s, D’Almaine was using the term CYLINDER FALL simply for instruments with a fall which was curved, rather than a FLAT FALL, so on that vague basis, it might seem that we could reasonably describe the majority of grand and upright pianos as having a “cylinder fall”, but the term tends to refer more specifically to keyboards which curve under the front edge, and are kinder to the knees. These seem to have faded away by about 1884. 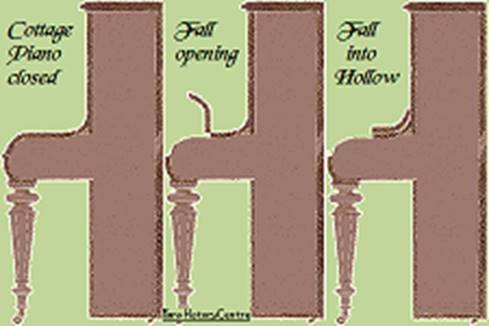 In earlier cottage pianos, the cylinder fall opened and folded back neatly into a piece known as the HOLLOW, which fitted it perfectly, but could result in a keyboard that was deeper front-to-back than the old cabinet pianos. It also provided a flat area where candlesticks could stand. By the end of the century, the hollow had gradually become shallower, and ceased to fit the fall, with the result that the fall often obscured the lower part of the decorative fretwork when the keyboard was open. Even today, tradesmen still refer to the “fall and hollow”, although they are often just flat strips of veneered chipboard. In and around the 1840s, there were various upright pianos made in which the upper half resembled an open harp, and the small soundboard was inside the lower section. The EUPHONICON was one of these, invented by John Steward, patented and built in 1841 by Frederick Beale, but some people refer to them simply as HARP PIANOS, and like the Harfen, some of these have a plucking action more like that of a harpsichord, instead of hammers. The Euphonicon had three ‘cello-shaped sound-boxes instead of the usual soundboard arrangement. From about 1855 to 1875, or “circa 1865”, some of these legs had a more ornate, carved top section, sometimes decorated with gold leaf. At a time in history when ladies didn’t show their legs, it may have been an exciting occupation for the men who carved legs for furniture and pianos, often featuring a thigh, calf and ankle. Over the years, I have heard various people suggest that the Victorians made skirts to cover the legs of their pianos, but I have never found any evidence to support this, and there are plenty of period illustrations of showrooms and exhibitions where the piano legs were on public view. D’Almaine’s literature described their hexagonal legs as “octagon legs” although they were not, and for a long time, I had the impression that cottage pianos always have hexagonal legs. 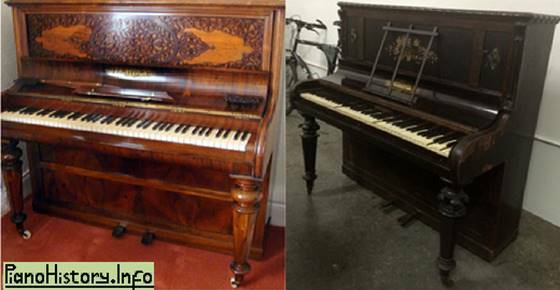 Wouldn’t you know that as soon as I said that, Graham Swan sent this picture (left) of his Collard & Collard cottage piano, made around 1862, which has 8-sided legs. Coincidentally from a similar date, Dave Salloway sent the picture on your right of an Oetzmann & Plumb cottage piano, also with octagonal legs. Now that our museum pianos are arranged in a time-line, it has become obvious that by the 1870s, most examples are octagonal. It’s the kind of odd, obscure detail that one would not think would have any useful impact on fashion or sales potential. I wonder how many people would even care how many sides the legs have. Around 1850 to 1880, or “circa 1865”, some pianos had fancy carved legs, usually linked to the case by toe-blocks, and known as “Pan Legs”, also known as “Running Legs” because it often appears that the piano is poised to run. If you have ever seen drawings of the god Pan, he had legs like a wolf. This was a more expensive, elaborate, individual design, and it is debatable whether these instruments should still be called Cottage Pianos, or whether mass-produced “London Legs” are important to our modern definition, but certainly these upright pianos are identical in every other way. The two small printing blocks on your left appeared together or separately in various ads for different firms around the 1860s, so they don’t show the actual pianos that these people were selling, but they represent (approximately) the most common forms of English upright piano at the time – London legs or Pan legs. The righthand pair are by Brinsmead, around 1870. 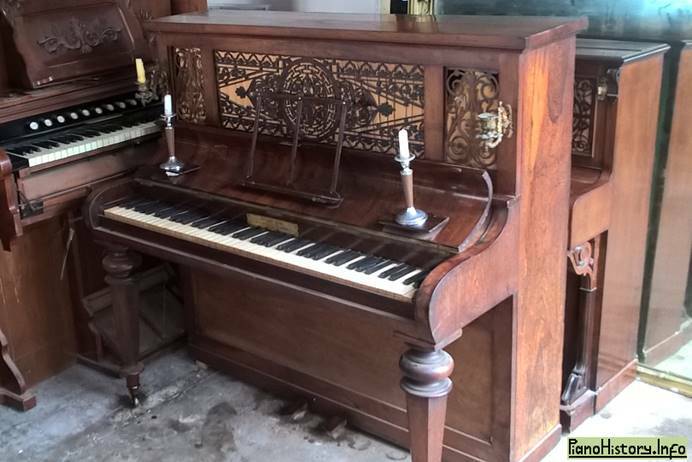 Our Challenger & Co. upright (kindly donated by Judy & Kevin Birch) is one of our most decorative pianos, it has Pan legs, I estimated that it was made around 1879, and it is dated on the bottom key – 1879! It also has another interesting feature found in some cottage pianos of the 1850s, 1860s and 1870s, a distinctive style of fretted music desk that pulls out from the top door, known as a “Lyre Desk Front”. 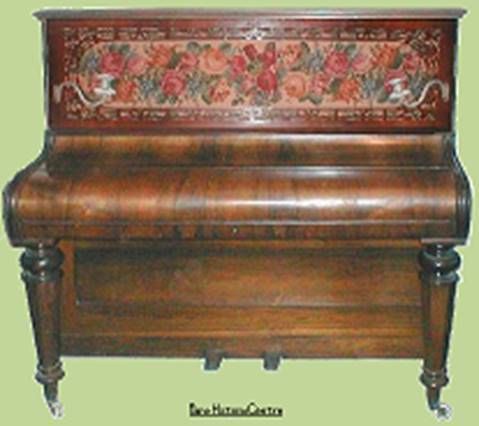 Another trend around that time, especially in Germany, was the style of decorative convex top on upright pianos, or sometimes just a shaped front edge. The Schiedmayer engraving is from 1851, most of the other estimates of dates fall within the 1860s. Makers included Ascherberg, Baumgardt, Collard, Dreaper, Irmler, Mand, Muller, Hoelling & Spangenberg. Steinway made them in 1890, and Palace Pianos have a Bluthner in this style dated 1902. There seem to be very few surviving German upright pianos from the Victorian era, even Bechsteins and Bluthners, and I get the impression that Germans must have destroyed old pianos. The so-called “French Legs” used on some French Pianinos and Grands are also known as “Swan legs” because when they were standing upside-down in the factory, waiting to be fitted, they were said to resemble a group of swans. Between 1875 and 1898, Renoir painted at least 7 pictures of ladies playing pianos, they all had French Legs. Illumination was a problem when homes had no gas or electricity, and it was necessary to have candles quite close if they were to be effective. Grand pianos had areas at each side for candlesticks to stand on. By the 1830s, Cottage pianos often had smaller candleboards, sometimes with decorative fretwork designs like the examples on your left, and sometimes hinged, to fold away when the piano was closed. The latest examples I can recall are from 1878. Robert Wornum, the genius who invented the best upright piano action ever, produced the candleboard shown on your right, probably the worst ever! He owes me for a few broken candlesticks! By the 1830s, a few had the projecting candle-holders known as SCONCES, and this decorative example is from a Bechstein of the 1890s. In cottage pianos, to avoid placing strain on their fragile fretwork, early sconces were attached to the outer ends of the case, but by 1860, some were mounted further in, on sconce posts nearer to the music desk, dividing the fretwork into 3 panels. By the end of the century, sconces were more-or-less standard equipment on upright pianos until the twenties, but in greatly varying designs. In wartime, metal fittings were often recycled to help the war effort, and sconces have often been lost or changed. We have many pictures of different piano sconces, but a particular model did not always have a fixed style of sconce, and customers could choose their own, so it is not possible to be sure what the originals looked like. Modern replacements are available from trade suppliers. Some old ones may be found on Ebay, but there is little opportunity to choose styles now, and sconces often sell for more than unrestored antique pianos. So do the stools. THERE IS NO SUCH THING AS A LOUD PEDAL! These were not even the first pedals used on pianos, and in 1780, Zumpe was advertising pianos with a different type of “pedals that make the piano perfect in every degree”. This implies that piano pedals already existed. More modern pianos may have a THIRD PEDAL, (the middle one) and although this can be another type of soft pedal, a concert grand will often have a SOSTENUTO PEDAL, which will only sustain the notes that are being held down at the moment when the pedal is pressed. This is quite a difficult technique to master, rarely used, but it is useful for PEDALPOINT, where a bass note is sustained through a series of chord changes. Around 1800, some pianos had a number of pedals for Turkish percussion effects, but it was only in the late 1800s that certain American makers began providing 3 or 4 pedals on some models. Pedals on cottage pianos are usually wooden, and are often much wider apart than modern ones, creating a position which gentlemen found more comfortable, and better balanced when seated, if a little less elegant for ladies. Will someone please explain to SuPerkins why men sit with their legs apart? The Piano Pavilion in Westcliff has a Broadwood “Patent Boudoir Model” made in 1844, with a keyboard compass (range) of 73 notes (6 octaves) F-F, unusual at that time. 6-octave pianos are more often from the 1930s to the 1970s. To arrive at the number of notes from the number of octaves, multiply by 12 and then add 1. The typical range of a cottage piano until the 1870s was 82 notes from C to A, but opinions varied about how this should be defined in terms of octaves, and although it is really 6¾ octaves, it was often described as 6⅞ octaves. This 1859 ad suggests that Chappells’ Foreign Model Pianoforte was superior to ordinary Cottage Pianos in having seven octaves (85 notes). By the 1870s, I think it is fair to say that most cottage pianos had 7 octaves, or 85 notes A-A, which is now the commonest range for old pianos. Some French makers had already been using 7 octaves for forty years then. I was selling new pianos with 85 notes in the 1960s, 88 notes was a sort of optional extra, not that there was any particular need to have 88, how many pieces of music even use those top 3 notes? Many people liked 73 notes, because it meant the piano took up less floor space, although it would be almost as expensive to make. See our Keys page. As you can see in this cut from our 1892 Post Office London Directory, there were people whose occupation was "Pianoforte Silker" and although most of the piano trade was male-dominated, silkers tended to be women. They were probably re-silking old pianos, because by the 1860s, fancy pleated silk fronts had largely been replaced by pierced fretwork with simpler cloth backing. In modern times, among her many creative talents, the late Mary Mobbs-Randall developed a wonderful technique for re-silking antique pianos into sunbursts and various other intricate patterns. She will be missed. Now, Kenneth Mobbs has joined her. These frets are quite thin and fragile, most have been damaged over the years, and these pictures are reconstructed from the least-damaged parts. Generally, the decorative panels are seen at their best when the keyboard is closed, and apart from early examples, having the panels fully visible when the keyboard is open seems to be an American feature. We presume that there must have been stencils used to cut these repeated patterns symmetrically, and it seems sensible that these would be re-used on pianos of the same model, yet in over forty thousand images, we have only managed to find two pairs of pianos with large panels that are identical, although small ones are occasionally seen in different makes. Complete pierced fretwork panels suddenly became much less common in the 1880s. The music stand on a piano is known as a DESK, and many older cottage pianos have the type known as a FALL DESK, which unfolds upwards from the fall. Occasionally they have a simple TRAY DESK, although these are mainly associated with later German uprights, and with modern uprights in general, so you may find that it is a fall desk that has been broken. By the 1880s, most English and European upright pianos had an OVERHANGING DESK which folded out from the top of the piano, and relied on double-jointed hinges, so that it could be folded away, out of sight when not in use. A minor difference in the French-style Pianino is that when the desk is in use, it holds the top open slightly, to allow more sound out. Overhanging desks often need repairs, but it is the special hinges that are most difficult to replace. These pictures are typical examples of the fairly small French uprights known as Pianinos, which were becoming known around 1847, when Chopin died. The style was common between the 1840s and 1890s, so it is very difficult to pin down a date by their appearance. They were usually plainer and smaller than Cottage Pianos, with columns and toe-blocks replacing the legs, but with the pierced fretwork replaced by a solid boxed-in front. Some German firms also used the term Pianino for much bigger uprights. The French makers adapted the 1826 action invented by Robert Wornum, London, although it had been largely ignored by British makers, so it became known as the “French Action”. In imitating the French Pianino, Broadwood and others also used that action. Also, the top of a Pianino is usually a HALF-TOP hinged onto the back half, whereas cottage pianos favour a one-piece FULL TOP. When the music desk is folded out, it holds the top open slightly, to let more sound out. In the 1860s, Chappell, Boosey, Cramer and Dussek were all producing similar instruments in the style of the pianino, Cramer called it a PIANETTE, Boosey simply called it MINIATURE PIANOFORTE. The twenty-guinea Chappell on your left was awarded a medal at the 1865 Dublin Exhibition, the one on your right (owned by Bill White) may be a little later, but it is very similar. At the time, Chappell does not seem to have had a piano factory, so it is possible that these instruments were imported from France. The Broadwood cottage on your left is from 1871, recently scrapped because it didn’t sell at auction, and I wasn’t quick enough to rescue it. The next is John Ruskin’s cottage piano, which we visited in his former home at Brantwood in the Lake District, and it owes its survival to the fame of its owner. The 1871 pianino-style instrument (kindly donated by Julian Silverton) is in our own Piano History Centre but the French makers sometimes did a better job of the decorative work, whereas this is a very functional box that does not do justice to the quality of workmanship inside. The 1872 example (kindly donated by Nick Wilson) has the pierced fretwork associated with cottage pianos, but combined with some later features such as trusses. The 1883 one is similar, but with fretwork, and there is an 1869 example like this one in the Victoria & Albert Museum. I inspected a similar example in Ipswich, and one was offered on Ebay for 99p. Our 1875 cottage piano by Wornum & Sons has areas of pierced fretwork at the top corners, but the solid panel behind it is interesting because the thistle design is inlaid over a very busy wood grain that (whether by accident or design) makes the work look more complex than it really is, almost the impression of a woodland scene. By the 1880s, the pierced fretwork fronts were widely abandoned in favour of solid wood panels, with the result that the sound was boxed in, and not nearly so pleasant for the pianist, because most of the sound could only come out through the back. This seems a backward step, but it soon became the norm for upright pianos. When fretwork panels are damaged, they are often replaced with solid panels, making the piano seem later than it is, and it would be more in keeping to use cloth or tapestry. If you are craft-minded, how about a cloth with a fretwork pattern embroidered on it? Or you can get a banner printed from a photo image of pierced fretwork. By the 1870s, some pianos were being decorated in a much simpler, cheaper way, by scratching a design through a stencil with a sharp tool, the so-called “incised decoration”. This is thought to be what was meant by Challen’s “Patent Engraved Panels”. By moving the stencils, incised designs could be made symmetrical, and adjusted to fit different-sized panels. The over-all effect sometimes looks as impressive as inlaid work, but is cheaper to produce. In 1884, Frederick Lording offered “panels incised and gilded from 2 shillings”. If it is not highlighted with paint, incised decoration is best seen when it is scratched through dark polish to the bare wood, so re-polishing tends to reduce the effect. London's cottage pianos (as defined especially by their legs) came to an abrupt end around the mid-1880s, when John Spencer was only just getting started, so he made very few. (The same applies to Bansall.) Spencer’s examples above date from around 1883-1885. Along with the external features, most cottage pianos also used what is known as a “Sticker Action”, which was never as efficient as Wornum’s action. The last known examples by Challen, Chappell and Collard are all dated 1885, but the serial number of a Cramer cottage piano suggests that it may have been as late as 1887. The traditional cottage pianos died out quite suddenly, but London makers seemed to struggle to settle on a new look for upright pianos, so there were lots of experiments in the 1880s which tried to look as decorative as the old pierced fretwork, but in a more solid boxed-in front like a Pianino. This should have been an exciting period, but many examples are quite ugly and clumsy. There were lines of fretwork, but also painted panels, inlaid work, marquetry, Egyptian styles, incised decorations, and little galleries, but often with a heavier Jacobean or Gothic influence, leaning towards the Arts & Crafts period. I have always intended to add a section about these, but they are so diverse, it is difficult to know how to represent them in a limited space. Our 1883 Collard & Collard example, while a typical cottage piano inside, is part of that experimental era, and it has 9 hand-painted panels, and 2 small pierced frets. The piano was in the Howkins Museum, but when our dear friend Val Howkins died, the piano was passed on to us. With the growth of the telegraph, wire-drawing methods improved, and in the pursuit of better tonal quality, piano string tensions increased, so pianos needed stronger structures. Sometimes, the heavy wooden bracings on the back (or underneath a grand) started to get so close together that there was more wood than space, but this traps the sound coming from the soundboard. You can see great variations in these pictures of different makes from the 1880s, and some of Wornum’s models had 80% of the back area covered in timber, so it might be a four-inch post with a one-inch gap. I have been puzzled by the weight of our 1874 Kirkman, as compared to the 1864 one. Neither has any significant amount of iron, and they use similar 3” posts, the difference is that the gaps reduced from 5” to 3.5” in 10 years, resulting in a much heavier concentration of timber. Around 1880, Macbeth’s ad was one of several which seemed to imply that the very definition of a Cottage Piano was that it did not have an iron frame. Some makers extended the iron hitch-plate to the tenor and treble sections, like my Challen drawing above, but by about 1870, David Witton claimed to be the "Inventor of the Improved Metallic Back", and he was using overstrung cast iron frames that were greatly in advance of most other London makers. Strangely though, they had sticker actions like cottage pianos, not entirely suitable for overstringing. Pohlmann & Son claimed to have produced the first English pianos with overstringing, but this was not true. Pleyel tried a different approach, vertical iron posts in the back. Around 1880, Schwechten, Berlin made a very unusual back with diagonal cast iron struts, similar in principle to Monington & Weston’s “Tuplex” double iron frame, but much earlier. 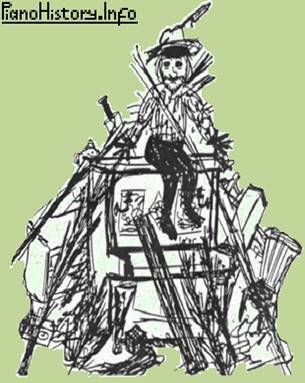 (Picture courtesy of http://pianoshop.co.uk) Schubert (U.S.A.) reckoned their steel back was “armored with wood” but this seems the wrong way round. By ordering cast iron frames in bulk from a foundry, the amount of manual work needed in the factory was reduced, because the wooden structure became much simpler. My drawing shows that by 1898, Chappells’ wooden back structure was very light and open, and the cast iron frame (inside) took most of the strain of the strings. By 1923, Henry Zender was making what we now term a BACKLESS piano, with no wooden bracings at all obstructing the soundboard, resulting in greater sound output from the back of the piano, although these models were uncommon then. Eric Kennard said "Dad designed a Backless piano which was a great success once you convinced the dealers that it was a step forward”. The same principle is applied to some grands, not just modern ones, but including Cluesman’s very shallow grands of the 1830s. Some small uprights (and some enormous ones like this 1887 Bluthner) continued to be described as "Cottage Pianos", but we have come to simply call them "Uprights". Their solid boxed-in fronts are more like the French Pianinos, and stop much of the sound that would otherwise come out of the front. The story of upright pianos continues on our Edwardian page. Our museum collection includes cottage pianos dating back to the 1840s, often still playable, with a sweet tone, although not as efficient or powerful as later instruments. Tuning can be a problem, but it is often possible to tune them well enough to demonstrate the sound, and it is interesting that completely untuneable pianos are more likely to be from the 1900s. Without donations, I will be fine, but our collection may not survive. If every visitor to this site made a donation, we would have better displays for our museum building, and much-improved facilities for research within our own archives.